Some proverbs hang in there. From situation to situation they simply capture, in the moment, how best to move forward. “Patience is a virtue,” has an etymology going way back. Yet the timeworn saying and it’s wait-wait-wait underpinnings helped dictate the outcome of Saturday’s World Cup 1.3-kilometer classic sprint in Otepää, Estonia. That is until Maiken Caspersen Falla broke up the final. But we’ll get to that in a moment. It was the modern course with its punchy ups and technical s-turn descents that kept patience in play. Fire too early on the demanding course and a fade would certainly follow. Temper the effort a bit, saving fuel for the later half of the effort, and good things might follow. Sweden’s Stina Nilsson laid down the day’s fastest qualifying time in 3:07.62 minutes. A time mark illustrating the race was no 2.5 minute blast. In other words, much of how the day played out on course would come down to the moments after the two minute mark. Two minutes into the race, the course kicked up with a 30-meter long herringbone section that often separated the pack. Athletes who conserved enough energy, positioned themselves near the front, kept a light yet robust herringbone, and pushed over the top were the ones most often positioned to advance in the heats. The descent from the herringbone-hill eventually took the sprinters into a swooping left hand corner and then into a 100-meter double pole straightaway parallel to the finishing straight. Those with the stamina to hammer out a double pole fared best in the closing 20 seconds of the sprint heats. In the women’s final Falla went up against Russia’s Natalia Nepryaeva, the Swedes Maja Dahlqvist and Jonna Sundling, and Slovenia’s Katja Visnar. The day’s fastest qualifier Nilsson, who advanced to the final as a lucky loser (there was a three-way photo-finish in her semi-final) did not start the final. According to the International Ski Federation (FIS) Nilsson fell after her lunge for the line and came up with a small yet unspecified injury. Out of precaution, she chose not to contest the final. Unlike many of the day’s heats which featured a cluster of skiers approaching the herringbone hill together, Falla and Nepryaeva began to separate as they threw down deep powerful strides on the course’s first major climb. At 45 seconds, the duo began forming a 10-meter gap on the remaining three finalists. 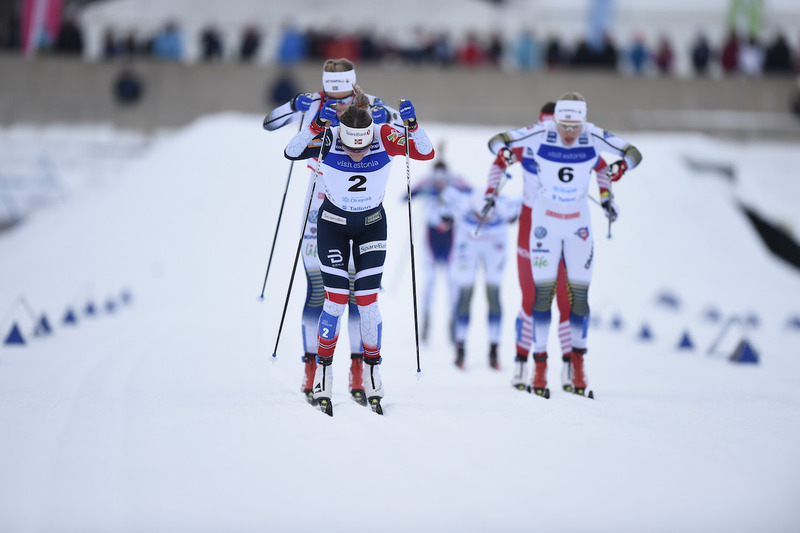 Over the top of the hill, Sundling fought to stay within a breath of Nepryaeva’s draft — Falla glided down alone five meters ahead. 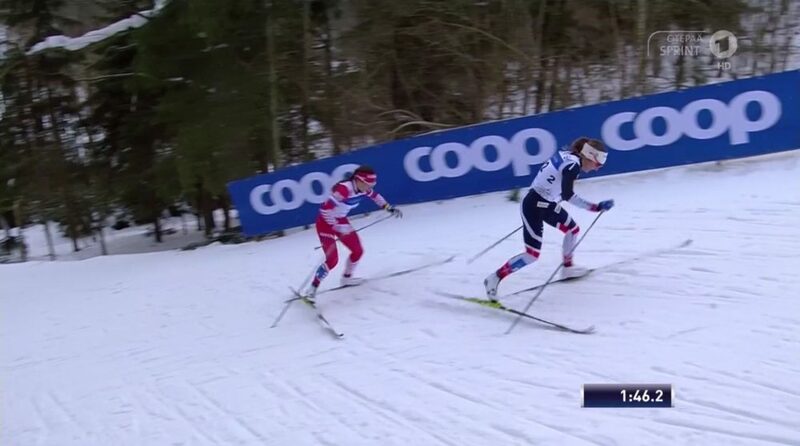 The two skiers further behind, Dahlqvist and Visnar, were markedly off the pace. As the course pitched left on a step-around corner, Sundling tumbled. From then on it was a two-skier affair. Falla fired on the herringbone hill and gapped Nepryaeva enough to secure the win. Falla won in a time of 3:05:16 minutes with Nepryaeva 1.40 seconds back for the podium’s second step. 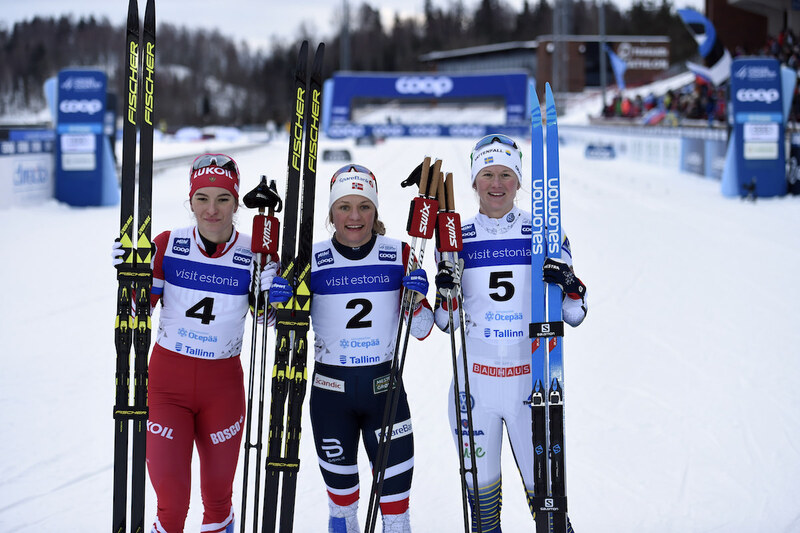 Dahlqvist placed third (+5.78) with teammate Sundling recovering after her fall to nab fourth (+8.12). Visnar faded to finish fifth (+23.22). It was Falla’s second World Cup podium of the season. She currently sits third in the sprint cup standings behind Nilsson in first. With the final a symbolic outlier when it came to the patience game, the U.S. Ski Team’s (USST) Jessie Diggins played the wait and wait philosophy. Diggins qualified in 18th and moved onto the semis after placing second to Falla in the second quarterfinal. In her quarter, Diggins shadowed the pack until the the mandatory herringbone hill when she moved towards the front and ultimately scored a semi spot. In her semi, which needless to say was primed with top-tier talent, Diggins bowed to the high pace to finish sixth and place 12th overall. Ida Sargent (USST) had a season best result after qualifying in 27th. Sargent skied in the third heat where Sweden’s Ida Ingemarsdotter set the tempo. Sargent looked strong in the opening moments as she matched the striding pace. Into the herringbone hill she fended off the charge of Finland’s Krista Pärmäkoski. Pärmäkoski cleverly sucked into Sargent’s draft to eventually pass the U.S. skier and place second in the heat. Sargent finished in third and did not advance as a lucky loser. Sargent’s 15th overall was her best World Cup result of the season. Also for the U.S., Sadie Bjornsen advanced int0 the heats after qualifying in 20th (+5.71). Skiing in the fifth heat, Bjornsen was the epitome of patience, waiting until the final two double pole sections to make a move. With only the last right hand turn and the final straight to navigate, Bjornsen fell among a pack of skiers. She was given a yellow card for obstruction. 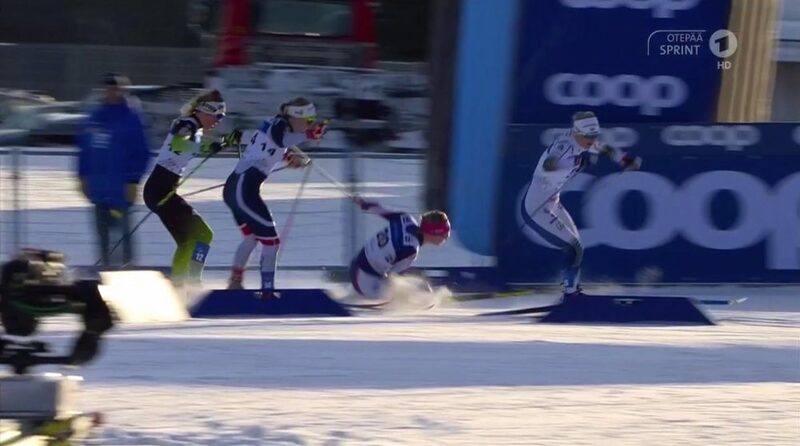 Bjornsen was matter of fact when it came to her fall — knowing sprints are rife with close-quarters positioning. The next opportunity comes for Bjornsen and the women’s World Cup field in tomorrow’s 10 k classic. Also for the U.S., Rosie Brennan (USST) finished 45th (+15.81).